- Arduino-like hardware IO: Board is based on open source firmware NodeMCU which is advanced API for hardware IO. It dramatically reduces the redundant work for configuring and manipulating hardware. The board allows you to code like Arduino in interactively manner with Lua scripting language. - NodeJS style network API: The firmware provides event-driven API for network applications, which facilitates developers writing code running this tiny little board in NodeJS style. Greatly speed up your wifi / IOT application developing process. - Lowest cost WIFI development tool: Price earmarked at merely Rs. 999/- at initial launch, this is extremely easy to prototype development kit in breadboard friendly form-factor and everything required on board. - All supporting sections included: The development kit has onboard USB to serial converter, LiPo battery charger and RGB LED with one IO button for quick prototyping and get going. - Reprogramming possibility: IO button available on the kit also functions as a re-flashing button for the wifi module. This means you can re-flash the module with latest firmware; which could be either nodemcu firmware or standard AT command set firmware. - Multiple uses: This development kit not only can be used for wifi development but can also be used as a simple USB to serial converter as well as LiPo battery charger on stand-alone basis. This means, you get functionality of 3 into one. - User directly in your application: This board has been carefully designed by keeping end user application in mind and thus comes with ready to use capability, out of the box. SmartWIFI is a wifi module development kit that can help you to prototype your wifi / IOT products within a few Lua script lines. 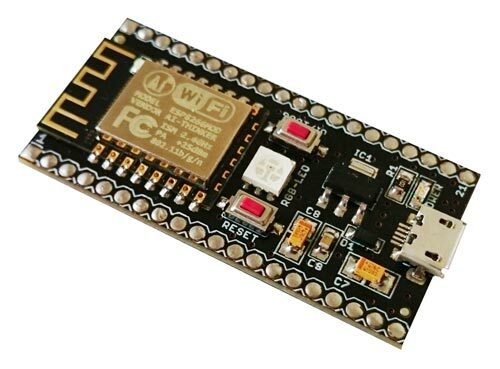 Based on ESP8266 chip and module built over it, the board is packed with many exciting features. Many functions are jam-packed in this tiny little development board at a very affordable price.